It’s the optimal temp for your pooch’s comfort and shampoo effectiveness. Get a mat for the bottom of tub. Slippery surfaces can be stressful for a dog. It’s more acidic than dog shampoo and can irritate your pet’s skin. Don’t use a flea shampoo on a regular basis. Flea shampoo is very harsh, so only use when necessary. Use an oatmeal-based shampoo with sensitive skin. Oatmeal balances the skin’s pH levels and calms inflammation. Remove odors with a deodorizing shampoo. Other shampoo types may simply cover up the problem. Reduce itching with a moisturizing shampoo. Or supplement with an oil like coconut, olive or fish. Any leftover residue can be irritating and dulling. Keep shampoo out of eyes and water out of ears. Not only uncomfortable, it can cause real health problems. Make bathing a positive experience. But don’t overdo it. 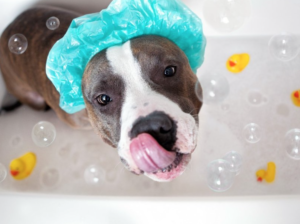 Most dogs only need bathed once a month. Instead, brush every couple days to pull oils through the fur and create a healthy sheen. Also consider a special pet spa treatment. Much like your own in these cold weather months, your dog’s skin is likely itchy, dry and flaking. Our hydrosurge acts like a pet massager. It injects water, air and shampoo through the coat, bringing oxygen to the skin. And leaves your pet’s coat cleaner and healthier. If your pet’s coat is continually dull or irritated, though, visit your veterinarian. There may be a serious skin condition that requires medical treatment. Don’t take a chance!